Yes you read it right. 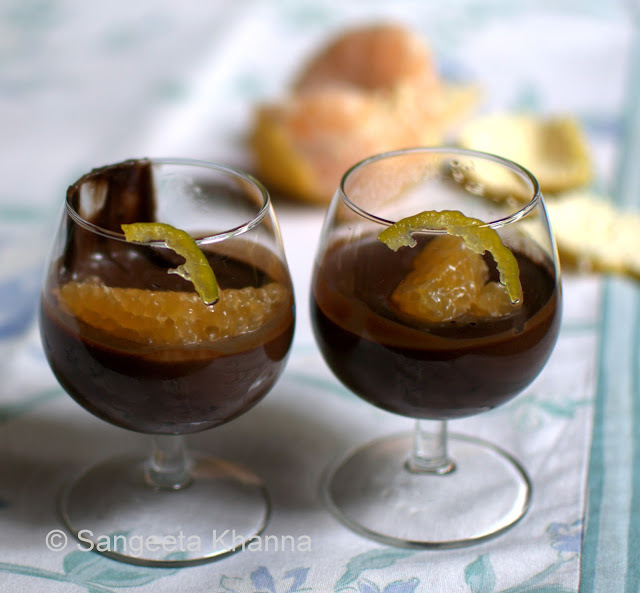 It is one single recipe for a luscious silky smooth chocolate mousse replete with flavors of citrus fruit and red wine. Now imagine what flavors abound this dark fantasy of a mousse? The recipe is as simple as a child's play. Cooking is limited to heating the dark chocolate on a double boiler or a couple of minutes in the microwave. Then there is mixing, whipping and seeing dark ribbons unfold around the wire whisk. A visual treat and redolent wait and then slurp the fruity treat. Many of you all already know I am not too fond of chocolate. And whenever I do chocolate it has to be a hot chocolate made with real dark chocolate , pinch of cinnamon and hot milk. Brownies are very rare for me(though I make frequently for the husband and others) and there used to be a chocolate mousse that I made using raw eggs at one point of time, but that was the time I just started cooking in my own kitchen and I thought it would be impossible to make a chocolate mousse without eggs. 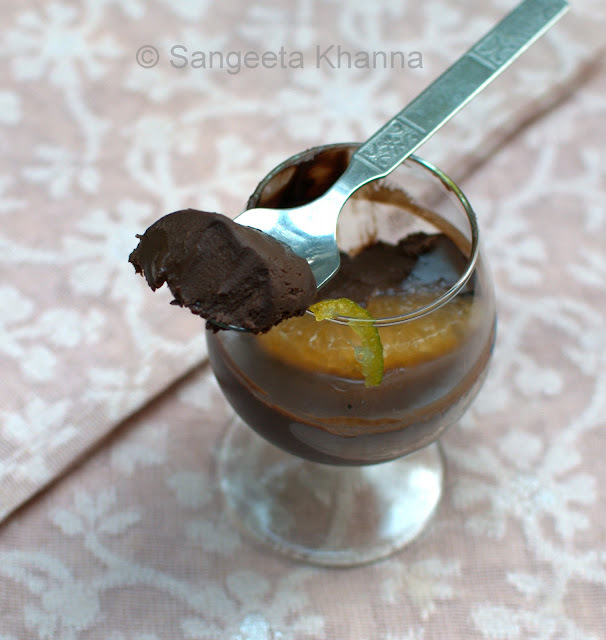 I used to make the chocolate mousse nervously in those days and whipping the egg whites and folding it into the melted chocolate and cream mix was my jittery moment. Almost a decade and a half has passed since then. The connection of eggs and a chocolate mousse broken. And I stand corrected after all these years. I tried a few recipes with ripe Avocado and Bananas too, but felt that the dark chocolate gets diluted that way. 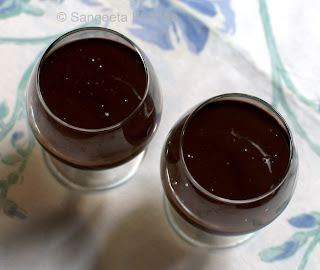 Graduated to experiment some more, pleasing the husband with some more chocolate treats, and then realised that simplifying the mousse is much more flavorful. A silky smooth, 'set' mousse can be done even with just fresh cream and fruit juice..or wine if you please. Melt the dark chocolate in a bowl kept on top of a pan with boiling water. The heat from the steam melts the dark chocolate melt in about 5 minutes. Add powdered sugar into it and whisk well to mix. Mix the cocoa powder and cinnamon powder to the fresh cream and whisk till the mixture thickens. You can avoid adding the cocoa powder in the cream if you are not looking for a deep dark chocolate mousse. The cream makes it lighter so I decide to make up the chocolate content by adding cocoa. Mix the cream mixture with the melted chocolate and whisk well. Let it cool a bit so it doesn't get split when you add the orange juice and the wine. When the temperature of the chocolate and cream mix is just a lil more than your palm, add the juice and the strained wine into it. 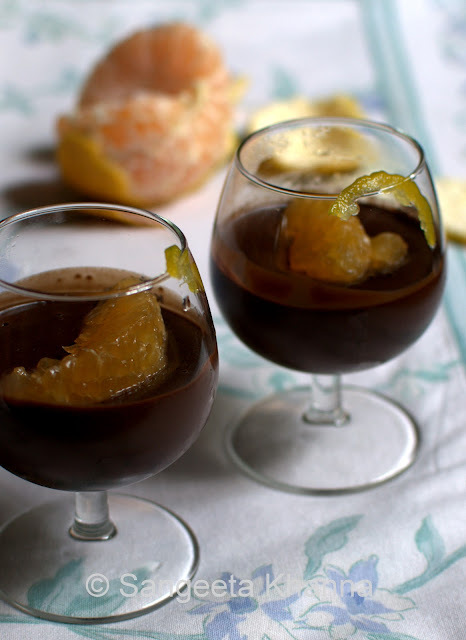 Fold in everything and pour into serving goblets or bowls. I used small goblets that hold 100 ml mouse. Garnish with a segment of orange cut to retain only the juicy arils. Garnish the rim of the goblet with a sliver of candied orange peel. The freshly candied peel is sticky and holds where you stick it. Very convenient. The red wine sangria coming through each lick of the mousse. I wont go into the details of the taste but I am glad it is one of those desserts so rich in taste that a small portion is enough to give a satiating experience. This small goblet of red wine sangria dark chocolate mousse was enough for my three desserts. The husband had this amount in one go. So you have as much as you feel like, the flavors are all yours. Small portions for those who are watching weight or sugar intake. 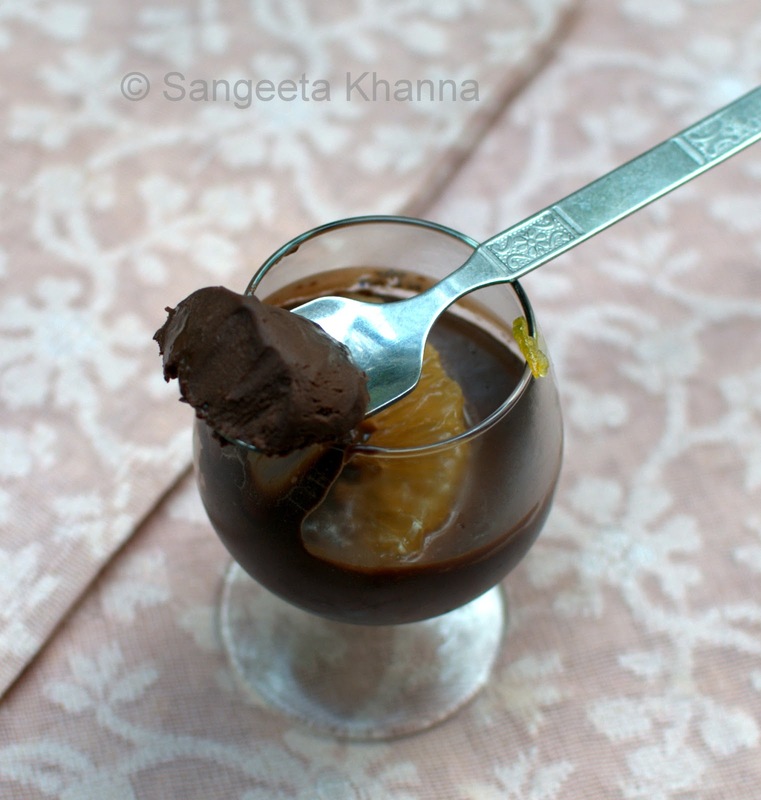 Did I tell you even a child can whip up this chocolate mousse? Thank you Four seasons for the wines. Indian wines are as good as the exotic sounding foreign wines I believe and Four Seasons have proved it right. 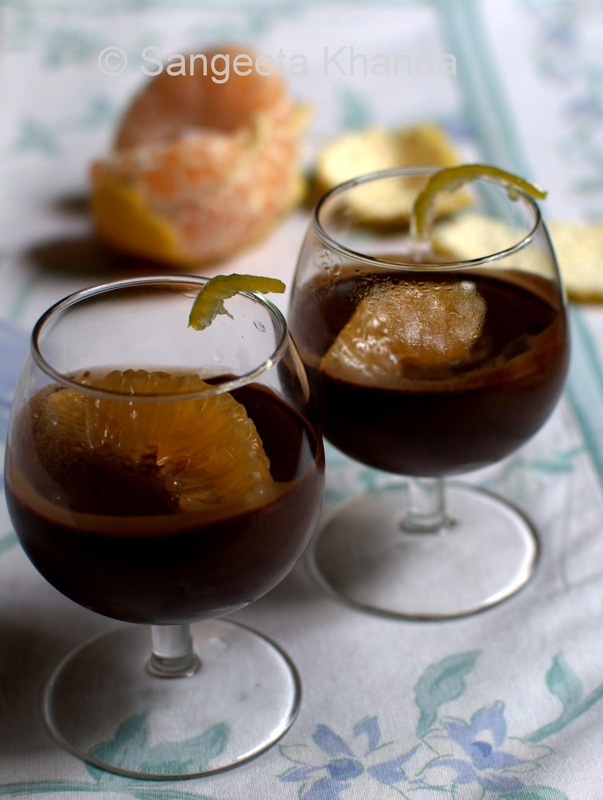 Red wines pair really well with dark chocolate and this red wine sangria dark chocolate mousse would make you want to make it frequently. Very frequently if you are a chocolate lover. 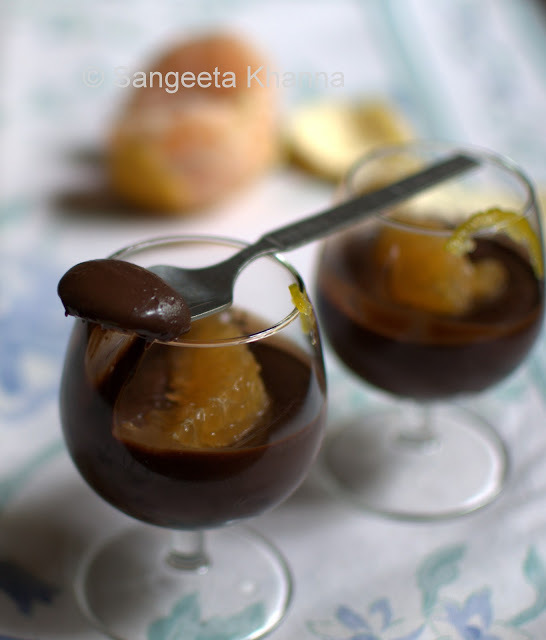 Make your red wine sangria more fruity if you wish for this dark chocolate mousse. 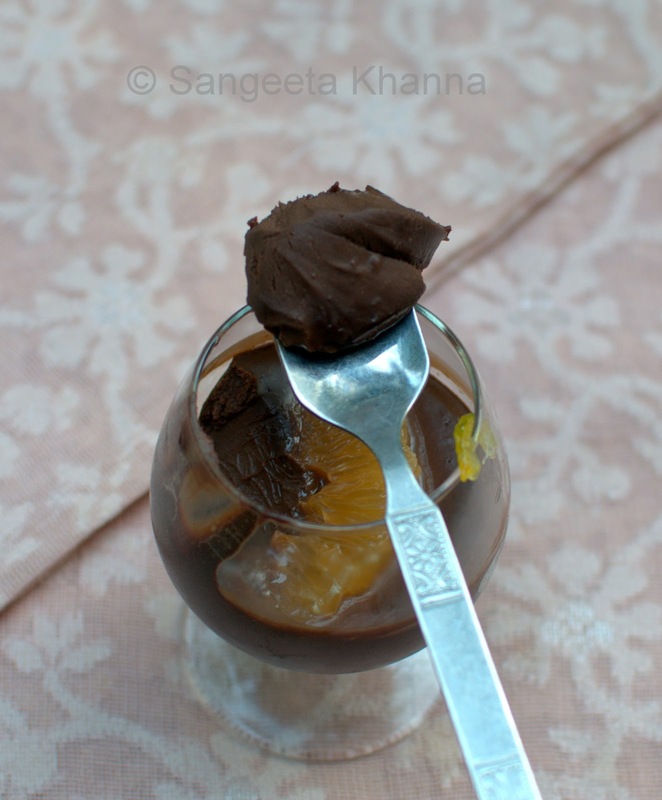 I like more of orange in this mousse so went only with orange. Some apple butter would do a great job here as well. Many of my friends wanted a recipe as soon as I posted a cell phone picture of this mousse on facebook. So here it is. Would love to know if you all try this recipe. Alright...I'm HUNGRY! Absolutely love the marriage of flavours and the simplicity of this mousse. Your writing is enticing too... makes me walk to the kitchen now! 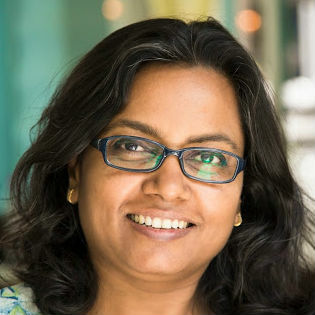 I love wine and chocolate and the two together....you are a heaven sent angel, Sangeeta! am gonna try this!!!! any shiraz will do na? ?